The Doppler effect is a physical phenomenon in which the frequency of a wave that hits a moving body undergoes a variation that is directly related to the speed of the body itself. The difference between the outcoming and the incoming wave is called Dn (or Doppler shift). The incoming wave has a higher frequency than the outcoming wave when the direction of the movement is towards the transducer while it has a lower frequency when the direction of the movement is opposite. 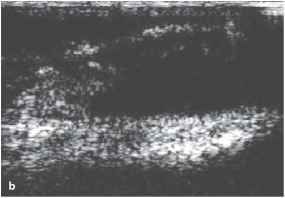 Therefore, the Doppler technique compares the two frequencies and measures the difference between them. - c = is the speed of the beam in the tissue. 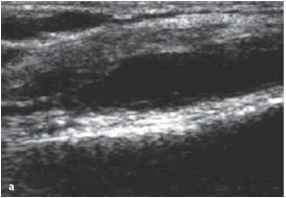 The transducer works like a normal ultrasound probe in all directions except one, selected by the operator. The Doppler scan is performed along this direction. The operator sets the volume sampler within the vessel so that a speed and audio assessment of the flow can be performed. The obtained speeds are represented on a graph. Moreover, with color Doppler, the obtained information can be represented as dot-by-dot color spots; each image is therefore the result of several processes: collection of data, encoding of B-mode and Doppler images and calculation of Doppler effect. The flow inside the vessels appears as color spots with different features according to the examined vessel (Fig. 1.13 a,b). The color scale that represents the flow can show three different parameters: direction (red: the flow goes in the direction of the probe; blue: the flow goes in the opposite direction), frequency and variance [8,15]. - there is no linear relationship between the speed values obtained from the color on the image and the values obtained from the spectrum analysis. In addition, the angle of incidence of the beam is extremely important. Referring to the Doppler formula and calculating the value of cosine (cos 90° = 0), the optimum angle is < 60°, even though some difficulties in assessing the vessel can be encountered. The introduction of power Doppler is fairly recent. It allows the detection of very slow flows and, thanks to the new techiques, their direction in relation to the transducer. Unfortunately, it is still not possible to obtain any semiquantitative color scales of the speed (Fig. 1.13 c, d). 3. it allows to perform a semiquantitative evaluation, describing the spectrum of frequencies (i.e. width and systolic-diastolic modulation). 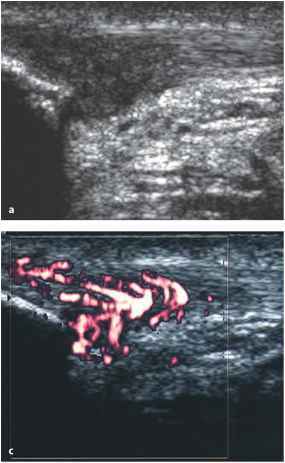 These Doppler techniques can be used to assess vessels in muscle thanks to the possibility of describing the caliber, the permeability and the presence of stenosis or pathological collateral circles (including malignant ones) . - malignant pathologies, giving the opportunity to characterize the lesion (even partially); in fact, benign lesions usually present regular vascularization and have just one afferent vessel, while malignant ones usually have several feeder vessels presenting with various wave shapes, simultaneous coexistence of low and high resistance flows, and a vascular network with disrupted architecture. 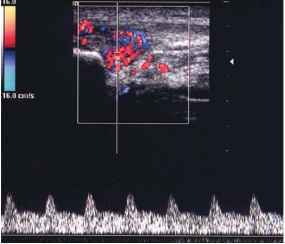 In particular, color Doppler is very helpful in rheumatology because it allows inactive pannus (almost avascular) to be discriminated from active (several blood spots inside); in this last case, the spectral analysis of the flow helps to distinguish the acute phase (with low resistance flows) from the chronic or quiescent one (where the resistances increase) [16-19]. 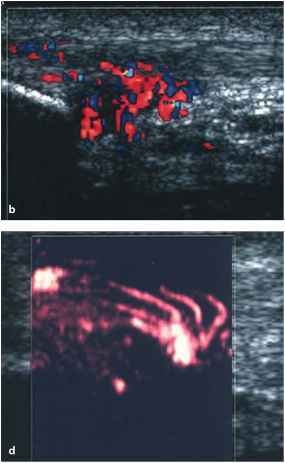 Therefore, color Doppler is a technique that supplements the traditional B-mode imaging and can be very helpful when assessing muscular masses: it does not supply any further information about the nature of the lesion, but can provide important indications for a subsequent biopsy. From a technical point of view, precise adjustment of Doppler parameters is highly recommended; the equipment must be set to assess low flows with low speed, applying low wall filters (WF) and pulse repetition frequency (PRF) between 700 Hz and 1 MHz. The gain is a separate consideration because it represents a parameter subjectively set by the operator. In rheumatology, the gain must be always set at the same level in order to follow up the modification of hyperemia and tissue perfusion inflammation during the progression of rheumatic pathology. With a thin layer of gel on the transducer, the operator can progressively increase the gain until some noise appears in the color box (1st phase) (Fig. 1.14); then the gain can be progressively decreased to reach a value just under the noise threshold (2nd phase)  (Fig. 1.15). The recent introduction of intravenous contrast media for ultrasound has allowed even the smallest vessels - such as microcirculation capillaries -to be assessed, enhancing the incoming echoes. 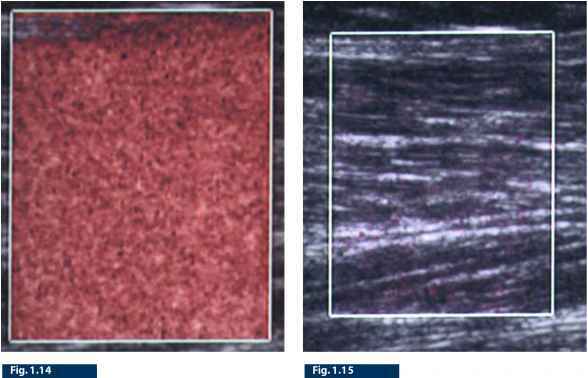 This has great relevance in rheumatology and, in particular, in the evaluation of the synovial membrane [4,5,21].In fact,its vascularization consists of very small arterioles and venules and, when inflammatory pathology is in progress, they have very low flow that cannot be assessed using color Doppler alone.